Next week I’m going to a cookie swap. After a fun night of chatting [and eating], each of the ladies attending will bring home a big plate of homemade cookies. An assortment like this is really lovely to have around the house for the holidays, especially since making more than one type can take an entire day of mixing, baking, cooling and cleaning. 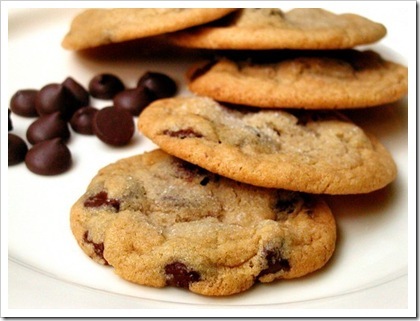 Of all the options, I normally end up making my favorite, chocolate chip. The best ever recipe I’ve discovered is Mom’s Chocolate Chip Cookies from the book Mom’s Big Book of Cookies: 200 Family Favorites You’ll Love Making and Your Kids Will Love Eating . The best chocolate chip cookie ever, courtesy of Mom. Combine flour, baking soda, and salt in a medium size bowl. Cream cooled melted butter and sugars with a wooden spoon in a large bowl. Add eggs and vanilla, beating until smooth. Stir in flour mixture until just incorporated (this is where my stand mixer comes in handy). Add chocolate chips and nuts if using. Place bowl in refrigerator for 10 minutes so the dough firms. Drop teaspoonfuls onto ungreased baking sheets and bake until golden, 9 to 11 minutes. After cooling on a wire rack, package in airtight containers. They’ll last 2 to 3 days. If you only have salted butter, you can use that. Just don't add the additional salt. Are you going to any cookie swaps this year? What’s your favorite holiday cookie? Baking cookies with my best friend tonight, you have me all excited to bake (and eat) now! Sounds delish. I’m going to try your recipe! 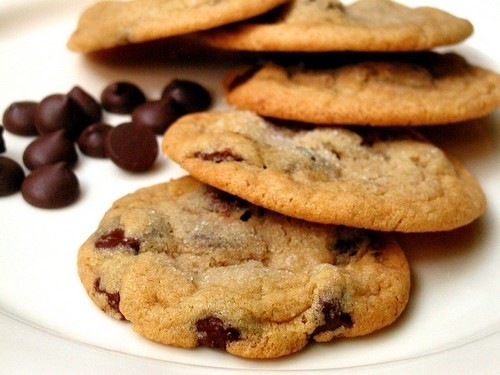 I don’t really think to make chocolate chip at Christmas time, but now I’ve got a hankering for them! Those sound so yummy! I may have to make those now.